These straight cut marl grey jersey trousers from Yoek make a great addition to your wardrobe, featuring an elasticated waistband for comfort and perfect fit. 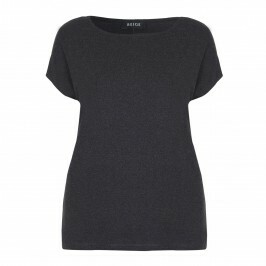 We’ll be wearing ours for the weekend with tonal knitwear. S=12/14, M=16/18, L=20/22, XL=24/26, 2XL=28/30 - all UK SIZES. Straight cut, grey marl, soft jersey trousers with elasticated waist. 81% Viscose, 14% Polyamide, 5% Elastane. Delicate machine Wash. (Do NOT Dry Clean) S=12/14, M=16/18, L=20/22, XL=24/26, 2XL=28/30 - all UK SIZES. Model’s height is 176cm (5ft 9.5in). For more information please call customer services on +44 (0) 208 455 0005 or one of our stores. S=12/14, M=16/18, L=20/22, XL=24/26, 2XL=28/30 - all UK SIZES.